Some emergency shelters are just that - meant to be used once or twice when needed and then never again. The Survive Outdoors Longer. 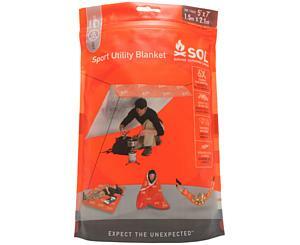 Sport Utility Blanket" is a different type of shelter - one that can be used as an emergency blanket one day and then as a picnic blanket the next. Use it to haul heavy loads, as a ground tarp underneath a tent, rigged as a shelter, or to cover your gear in foul weather - the Sport Utility Blanket" will be up to the task. Even with many times the strength of similar multi-use blankets and tarps, plus a scorching 95% heat reflectivity rating, the Sport Utility Blanket" still weighs in at a feathery 11.3 oz.